(Photos Clockwise) Ambassador Lhuillier delivered his message during the inauguration of the Philippine exhibit. The Ambassador was met by Mr. Fernando Saez, Director of Museo Nacional de Antropologia, who also donned the Barong Tagalog. Before the formal opening, the Spanish media covered the inauguration. H.E. 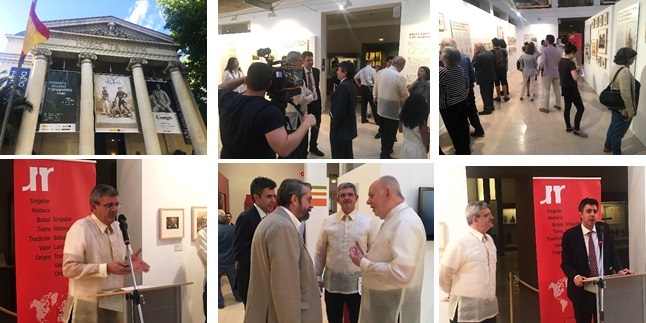 Ambassador Philippe J. Lhuillier co-sponsored and graced the opening of the Philippine exhibit entitled Imágenes de Una Exposición: Filipinas en el Parque de El Retiro, en 1887 (Images of An Exhibition: Philippines at El Retiro Park, 1887) on 29 June 2017 at the Museo Nacional de Antropología in Madrid, as part of the Philippine Embassy’s celebration of the 70th anniversary of the establishment of diplomatic relations between the Philippines and Spain. The exhibit, which was organized by the Museo Nacional de Antropologia and the Spanish Ministry of Education, Culture and Sports, featured the photos related to the 1887 “Philippine Exposition” which was held in Madrid’s Retiro Park. In his message, the Ambassador acknowledged the efforts of the organizers for putting up the exhibit on the Philippines. He said that projects such as this one showcase the strong relations between the Philippines and Spain as both countries celebrate the 70th anniversary of diplomatic relations. 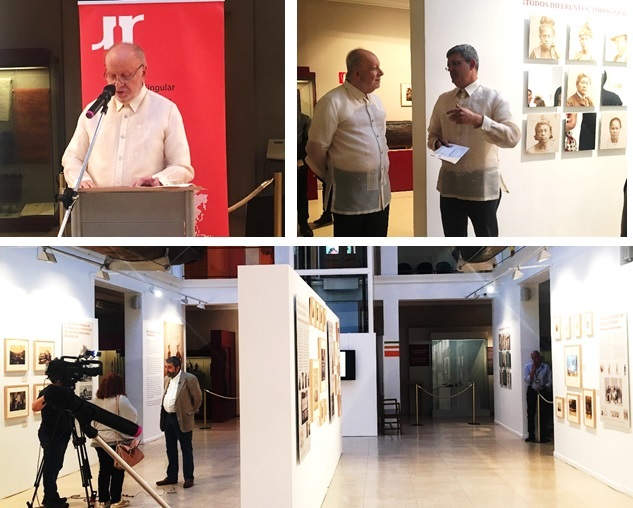 While the photographs currently on exhibit are impressive due to their sheer volume, the Ambassador pointed out that much has changed about the Philippines, about Filipinos and their culture, since 1887. The image that the pictures portray about the Philippines and Filipinos is not the same image one will have when one now visits the Philippines and interacts with the Filipinos of the present day. He also underscored the fact that the photos are not “objective representations of Filipinos in 1887 or of Filipinos in the 19th century” since the photographers who took them were inevitably influenced by the social, political, cultural and religious biases of their time and place. Museum Director Fernando Saez also mentioned that the exhibit is aimed at remembering the event 130 years ago, but not to commemorate them, since the attitudes have changed with regard to concepts relating to the political and economic control of territories. Subdirector General of State Museums Lucas Guirao also offered some insights on the exhibit, which was attended by at least 120 persons. A cocktail reception of Filipino delicacies (sponsored by the Philippine Embassy) capped the event.